Larry Fink’s recent letter to CEOs is titled “A Sense of Purpose,” and in it he makes the case for the CEO leadership for societal good. As the CEO of Blackrock, the largest asset manager in the world, Fink manages more than $6 trillion in investments through 401(k) plans, exchange-traded funds and mutual funds. In the past, Fink’s BlackRock has been viewed as a passive investor. People like Bill Ackman, Carl Icahn, and Paul Singer, on the other hand, are considered “activist” investors, because they claim to look out for shareholders by pushing companies to innovate and change. Their maneuvers often deal with share buybacks and breakups – profit maximization, often in the short-term, to the detriment of the brands they purport to be saving. Profits without prosperity, is what this “activist” approach has been termed in the past. Fink’s sense of responsibility is to be commended. We also see many governments failing to prepare for the future, on issues ranging from retirement and infrastructure to automation and worker retraining. As a result, society increasingly is turning to the private sector and asking that companies respond to broader societal challenges. Indeed, the public expectations of your company have never been greater. The failure of government to do its job has caused companies to take up the slack. This is not uncommon in developing nations, where we’ve seen companies in India, the TATA group for example, cast a wide social net. Without a sense of purpose, no company, either public or private, can achieve its full potential. It will ultimately lose the license to operate from key stakeholders. For reference, Blackrock’s ESG (Environmental, Social, Governance) commitment spans a range of issues, including measures of company carbon emissions, labor and human rights policies, and corporate governance structures. Meanwhile, the pushback against Larry Fink’s position has already begun. Billionaire investor Sam Zell has called Fink “extraordinarily hypocritical” for his call to nudge companies towards greater social responsibility. Mr. Fink’s declaration is different because his constituency in this case is the business community itself. It pits him, to some degree, against many of the companies that he’s invested in, which hold the view that their only duty is to produce profits for their shareholders, an argument long espoused by economists like Milton Friedman. Yet Fink is not alone in his views. The World Economic Forum has called this the New Age of CEO activism. The World Economic Forum is stimulating CEOs and their companies to take more interest in addressing social problems found around the world. 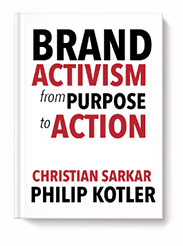 Additionally, the Harvard Business Review just published The New CEO Activists, by Aaron K. Chatterji and Michael W. Toffel, in which they make an important point: the more CEOs speak up on social and political issues, the more they will be expected to do so. And increasingly, CEO activism has strategic implications: In the Twitter age, silence is more conspicuous. Weber Shandwick, in partnership with KRC Research, released CEO Activism in 2017: High Noon in the C-Suite. The survey measures attitudes toward the trend of chief executive officers (CEOs) speaking out on hot-button societal topics, revealing stark generational differences when it comes to perspectives on CEO activism. 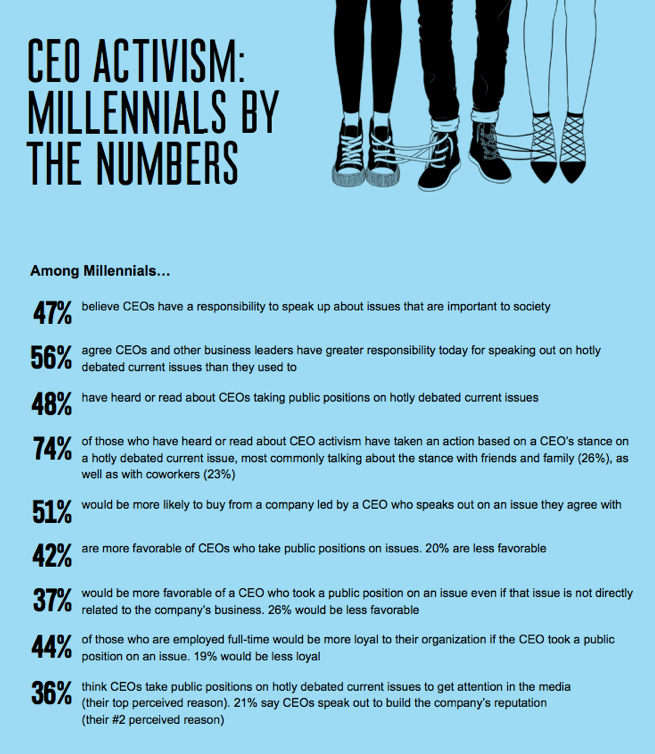 47 percent of Millennials believe CEOs have a responsibility to speak up about issues that are important to society. The percentage is lower among Gen Xers (ages 37-52) and Boomers (ages 53-71), standing at 28%. Traditionalists strongly believe that companies should “stick close to their knitting” and work hard to create profits to satisfy the expectations of the company’s owners and investors. Professor Milton Friedman of the University of Chicago passionately believed that CEOs and companies have the fiduciary responsibility of maximizing the returns to the company’s owners and investors. Why would investors want to receive less than the maximum return? Why let CEOs decide on which social problems the company should invest its hard-earned profits? Let investors make the social decisions that they want. Normally, social problems are supposed to be the responsibility of government and nonprofit organizations (NPOs). Government needs to help provide an effective health care system, basic education system, infrastructure and other systems needed for the common good that cannot be supplied by private industry. But the plain fact is that our government is not up to these tasks. Our Congress is paralyzed by dissension and political party gridlock. Congress can hardly pass any new legislation to address such problems as immigration, hard drugs, guns, poverty, climate and pollution, and infrastructure. Furthermore, the national debt is so high that Congress periodically faces the alternative of shutting down the government. If our government is incapable of addressing these problems, this leaves the social problems to the vast array of nonprofit organizations, often called the third sector. The third sector has all kinds of NPOs dedicated to supplying services and solutions to common social problems. But these NPOs are voluntary organizations that have to raise funds to carry out their activities. Their resources are limited and subject to highs and lows depending on the economy. The only other group that can offer help in solving social problems are business organizations. Unilever once again displayed its brand activist leadership when Keith Weed – CMO at the world’s second largest advertiser – threatened to pull marketing spending from digital platforms that failed to take a stand against fake news and divisive content. Reports say that Weed has stated that brands can no longer stand by while hateful content that promotes sexism, racism, and extremism infiltrates social media platforms. “We cannot continue to prop up a digital supply chain … which at times is little better than a swamp in terms of its transparency,” Unilever marketing boss Keith Weed will say, according to a copy of a speech obtained by CNN. Unilever’s website tells us more about their way of thinking: Research shows that consumers are actively choosing to buy brands that they believe are doing social or environmental good. This is why we are developing our ‘sustainable living’ brands. The Tide, pardon the pun, is turning. Some businesses, such as Starbucks, Unilever, IBM, and others have CEOs who are willing to assume some responsibility for social problems. Noting the problems in the U.S. health care system, CEO’s Warren Buffet, Jeff Bezos and Jamie Dimon recently joined together to design a better health care plan for their employees (the jury is still out on this one). And CEO Tim Cook of Apple said that as government fails to deliver, business and other areas of society need “to step up.” All businesses benefit from a well-working economy with good infrastructure and well-trained and motivated workers. Companies are basically known by the public through their brands. Strong brands have a clear purpose and attract a very large following. Some brands would like to complement their purpose with a higher purpose. Ivory soap, for example, supplies excellent cleaning power. A higher purpose for Ivory is to fight colds. Procter and Gamble urges regular use of Ivory soap to help people avoid colds. The Ivory brand can go further and help schools teach children the value of soap and cleanliness. The final consideration is whether the brand delivers brand beneficence. 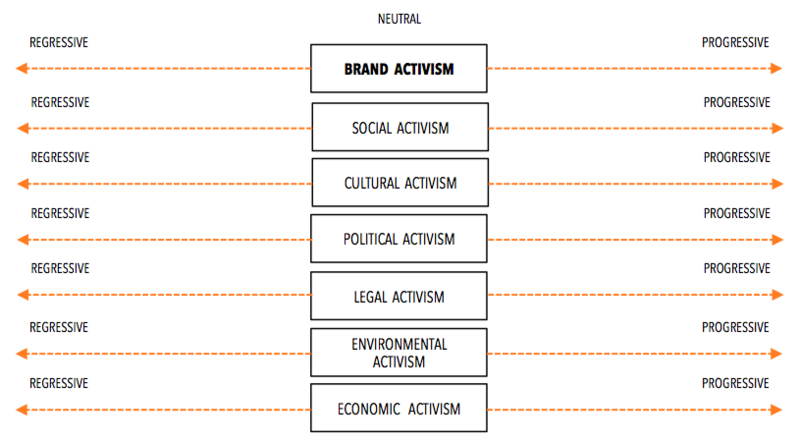 We believe that companies would benefit from making their brands more activist. And if they don’t? The techlash is coming. Scott Galloway just made the case for breaking up Facebook, Apple, Amazon, and Google. Social activism includes areas such as equality – gender, LGBT, race, age, etc. It also includes societal and community issues such as education, school funding, etc. Legal activism deals with the laws and policies that impact companies, such as tax, workplace, and employment laws. Business activism is about governance – corporate organization, CEO pay, worker compensation, labor and union relations, governance, etc. Economic activism may include minimum wage and tax policies that impact income inequality and redistribution of wealth. Political activism covers lobbying, voting, voting rights, and policy (gerrymandering, campaign finance, etc). Environmental activism deals with conservation, environmental, land-use, air and water pollution laws and policies. What role do we play in the community? How are we managing our impact on the environment? Are we working to create a diverse workforce? Are we adapting to technological change? Are we providing the retraining and opportunities that our employees and our business will need to adjust to an increasingly automated world? Are we using behavioral finance and other tools to prepare workers for retirement, so that they invest in a way that that will help them achieve their goals? Each company must make its own decision on how it can contribute to the society beyond making profits that it shares with its investors and other stakeholders. Making money is not enough. As more companies get convinced that they should assume some responsibility for building a better society, everyone gains! Christian Sarkar is the editor of this site, an entrepreneur, consultant, artist, and activist. See the $300 House project and FixCapitalism.com.